Jan Vogler’s distinguished career has seen him perform with renowned conductors and internationally acclaimed orchestras around the world, such as New York Philharmonic, Leipzig Gewandhaus Orchestra, Deutsches Symphonie-Orchester Berlin and London Philharmonic Orchestra. His strong artistic foundation has allowed him to explore the boundaries of his sound, creating an ongoing dialogue also with contemporary composers and performers. He regularly premieres new works, for instance compositions by celebrated composers Tigran Mansurian (with WDR Symphony Orchestra conducted by Semyon Bychkov), John Harbison (with Mira Wang and the Boston Symphony Orchestra), Udo Zimmermann (Bavarian Radio Symphony Orchestra), Wolfgang Rihm (Double Concerto with Mira Wang) and Jörg Widman (Cello Concerto “Dunkle Saiten”, dedicated to Jan Vogler himself). The New York Times praises his “soulful, richly hued playing” and the Frankfurter Allgemeine Zeitung grants him the ability “to make his Cello speak like a singing voice”. Jan Vogler has been Director of the renowned Dresden Music Festival since October 2008 as well as Artistic Director of the Moritzburg Festival since 2001. In 2017 the Moritzburg Festival celebrated its 25th anniversary as one of the most established chamber music festivals internationally. Highlights of the 2018/19 season include recitals with his longtime collaborator, pianist Hélène Grimaud, concerts with the orchestra of the Mariinsky Theatre and Valery Gergiev in Berlin, Dresden and St. Petersburg, the Munich Chamber Orchestra, the Singapore Symphony and appearances in Dresden and Cologne with the WDR-Sinfonieorchester and its chief conductor Cristian Măcelaru. Furthermore and together with actor Bill Murray, he will again concentrate on their project “Bill Murray, Jan Vogler & Friends – New Worlds”. This internationally acclaimed, cutting-edge program brings together works by Twain, Hemingway, Whitman, Cooper, Bernstein, Bach, Piazzolla, Mancini, Gershwin and Foster in an unexpected and enchanting exploration of the intersection of music and literature – the featured songs are paired with literary readings brought to life with classical music. It was released on CD at the end of September 2017 by Decca Gold. “Bill Murray, Jan Vogler & Friends” premiered the program in June 2017 at Dresden Music Festival and will tour with it extensively world-wide, in season 2018/19 et al in Australia. Highlights of Jan Vogler’s career as a soloist are concerts with the New York Philharmonic – both in New York and Dresden at the occasion of the inauguration of the rebuilt Dresdner Frauenkirche under the direction of Lorin Maazel in 2005 –, Chicago, Boston, Pittsburgh and Montréal Symphony Orchestras, Mariinsky Orchestra, Sächsischen Staatskapelle Dresden, City of Birmingham Symphony Orchestra, Orchestra dell’ Accademia di Santa Cecilia, Vienna Symphony Orchestra, Munich Philharmonic as well as with The Knights. He collaborates with conductors such as Andris Nelsons, Fabio Luisi, Sir Antonio Pappano, Valery Gergiev, Thomas Hengelbrock, Manfred Honeck and Kent Nagano. Jan’s long-term collaboration with the Label Sony Classical began in 2003 and has resulted so far in roughly 20 CDs. His latest release is a recording of double concertos for violin & violoncello by Rihm, Brahms and Harbison, together with violinist Mira Wang, the Royal Scottish National Orchestra and conductor Peter Oundjian (May 2018), as well as Schumann’s cello concerto together with the Dresden Festival Orchestra and Ivor Bolton (October 2016). Previous recordings include Tchaikovsky’s Rococo Variations with the Frankfurt Radio Symphony Orchestra, conducted by Andrés Orozco-Estrada and the Moritzburg Festival Ensemble (March 2016), Concerti di Venezia with La Folia Baroque Orchestra featuring Venetian Cello Concertos from the 18th century from Vivaldi, Caldara, Porpora e.a., the Schumann album Dichterliebe with Hélène Grimaud e.a., and his critically acclaimed recording of Bach’s Six Suites for Unaccompanied Cello. After the success of his CD My Tunes featuring short character pieces, a volume 2 was published shortly after. 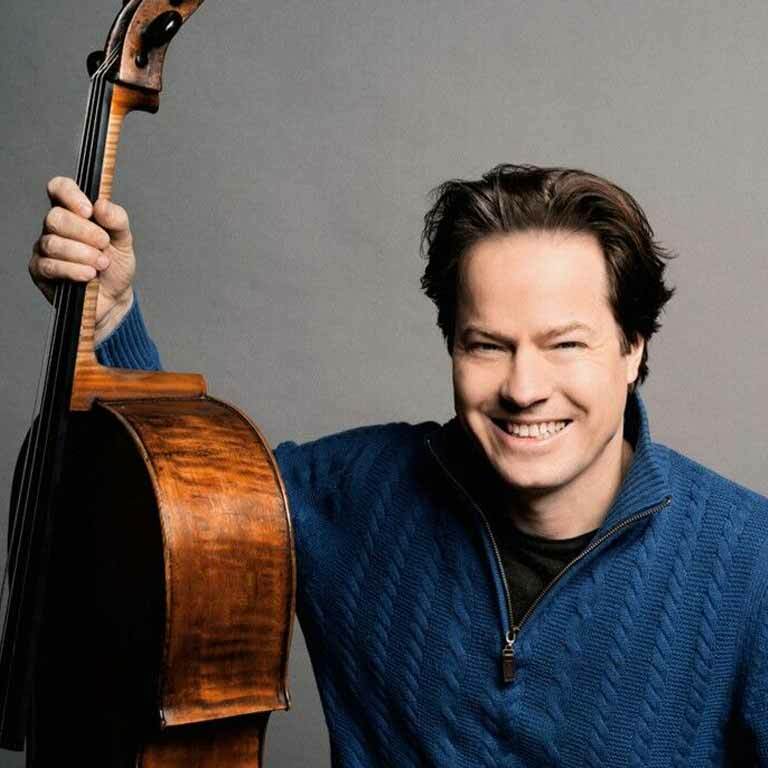 It was followed by an award-winning recording of Dvořák’s Cello Concerto with the New York Philharmonic under David Robertson (Pizzicato Supersonic Award, Diapason d’Or Janvier, Choc – Le Monde de la Musique Mars). In 2006, he received the European Award for Culture and in 2011 the Erich-Kästner Award for tolerance, humanity and international understanding. In June 2018 he received the European Award for Culture TAURUS as Director of the Dresden Music Festival. Jan Vogler plays the Stradivari ‘Ex Castelbarco/Fau’ 1707 cello.